This week there are two auctions that instantly jump off the screen as great auctions. Those auctions also left me slightly puzzled. The first auction, Mattel M.U.S.C.L.E. NEW FACTORY SEALED W/SUNSHINE 10-Pack in Trash Can 1985, is a basic Flesh 10-pack. There’s nothing particularly special about it – except the price. 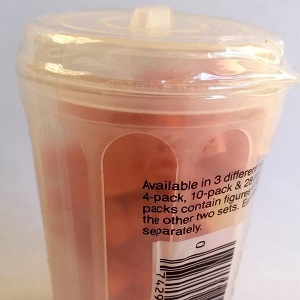 These days many sellers hilariously overinflate the opening bid or BIN price for a sealed 10-pack of M.U.S.C.L.E. figures. A $0.99 opening bid is always the most attractive to buyers, but it is very difficult to argue with the $20 opening bid. Highlighting the “Sunshine” figure is an odd choice. If that fact is important, then why not specifically identify the figure? At first glance it might be #64, but it wasn’t important enough to spend any more time looking at it. Even if it was #221, does anyone care? It’s just a regular Flesh figure that’s difficult to see in a 10-pack. I can appreciate collectors wanting specific 4-packs. It is easy to display the 4-pack and prominently display favorite figures. Not nearly as easy with a 10-pack. This auction will likely end with a happy buyer and seller, but I will never understand attempting to highlight a plain-old Flesh figure. Am I wrong? Super rare. Has been sitting in my collection since the 80’s. Took amazing care of it. Has the super rare Spinning Head Ashuraman in package. If I had a SHA 10-pack I was trying to sell, then you would see the best pictures humanly possible. If I knew enough about M.U.S.C.L.E. 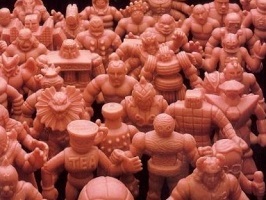 figures to identify a SHA, then I would know the M.U.S.C.L.E. community (my potential buyers) would be skeptical. I guess I’ve answered my own question. People lie in an effort to take advantage of the excited and uninformed. People lie to take advantage of others. 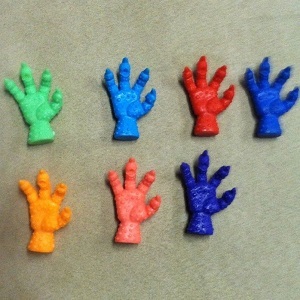 The second auction, M.U.S.C.L.E Claw 6 figure lot with bonus muscle figures, is for six M.U.S.C.L.E. #153 figures plus a fake resin Purple #153. There were two reasons this auction jumped off the screen. First, I’m always curious to watch buyers overreact to #153 auctions. Second, the opening bid of $1 is absolutely idyllic for an auction like this one. When I clicked through I saw the auction also had free shipping and was being sold by an old friend of the site meatcutta. Because I know “Meat” I know that he’s a stand-up guy and a trusted seller. It was too bad he had several negatives for M.U.S.C.L.E. auctions. I wonder what the story is behind that situation. The feedback leads directly to my confusion with this auction. Why is there a Reserve Price on this auction? If the seller wants to maximize his sale price, then single figure auctions are the solution. Buyers will certainly over pay for exclusively the figure they need for their collection. If the seller wants to make the sale easy for himself, then a Reserve Price only increases the likelihood of relisting and extending the selling process. And the process has already gone on for some time with unsold BIN’s of $475, $350, and $300 (twice). Combining the somewhat blurry pictures, negative feedback, and the Reserve Price makes this a bit scary for bidders that don’t already know meatcutta. If I didn’t know the seller, then this auction would certainly raise some cautionary red flags for me. People go crazy for #153 figures. This auction could simply start at $1.00 (without a reserve) and easily climb to $150. It wouldn’t surprise me if it got to around $250 – which is very close to the most recent $300 BIN. So why have the Reserve Price? This entry was posted on Thursday, October 6th, 2016 and is filed under Auction Watch, UofM News. You can follow any responses to this entry through RSS 2.0. You can skip to the end and leave a response. Pinging is currently not allowed.